With the decreasing brand loyalty and attention span of customers, it is more important today more than ever to create a memorable story in every branding campaign. In this post, we will discuss how new domains can help you create a more impactful branding campaign by creating specific microsites on new domains. Read on! Microsites are websites with at least 3 pages created specifically for a branding campaign. These websites have a unique domain name of their own, which is separate from the business’s primary domain name. Such websites are a great way to promote a campaign where the objective is to offer an experience of the brand as opposed to sales-driven marketing. You can create a website for your branding campaign in 3 simple steps at Simplesite. How Can New Domains Help in Branding Microsites? You can also pick universal domain extensions such as .ONLINE, .SITE, .WEBSITE if they fit the purpose. For example, www.louder.online is a digital marketing agency that helps their client’s voice become ‘louder online’. Here, they have used .ONLINE in a unique way that helps them strengthen their brand positioning. Brand Story: Let’s say you have a dating app and you want to create a separate website for customers to share their love stories and read what others have shared, you can choose a new domain such as lovestories.space or lovethrough.tech if you want them to talk about how they met their soulmate through technology. Games: Assume you have a dairy business and you wish to create a game about making cheese, you can choose a domain name such as milkandcheese.fun. Events: If you are organizing a tech event and want to create a separate website for the same, choose a domain name such as letstalkabout.tech. A descriptive name such as this one will simplify the marketing and promotions for the event to a great extent as well as resonate with the target group instantly. Information / Content: Perhaps you just want to create a website that spreads awareness about your industry based on a research that you conducted. You can choose a domain name such as myhealthstats.site for a health related website or historyofpizza.space for facts related to pizza’s history. 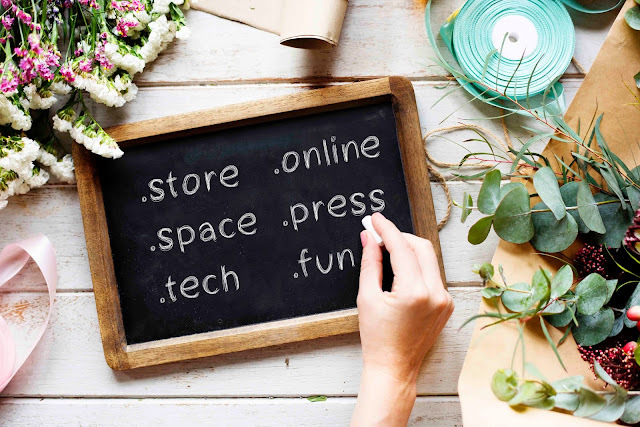 By registering such unique domain names, you will be able to create a more impactful and memorable brand message for the customers. These web addresses are easy to communicate and tend to stay etched in the customer’s memory. Make your next branding campaign more interesting, memorable and effective with a website on new domain extensions.